All trains have a story. 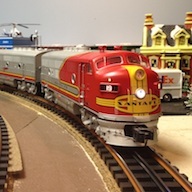 I’m sure many collectors have bought a special locomotive and wondered ‘What is this train’s story? Who owned this locomotive before me?’ Was it in a well-known collection, a birthday or Christmas present? Well, I had that experience when I bought the pride and joy of my Hornby collection, the Princess Elizabeth (PE) locomotive. It would be difficult to trace the surviving PE’s as they were made without serial numbers or other individual identification marks. It would be a task but I would not want to deter anyone from attempting it. There are probably not that many, less than a thousand or so remaining, and with today’s computers, correspondence and pictures, this could be undertaken. The Princess Elizabeth locomotive was produced by Hornby starting in May 1937 and sold at that time for the princely amount of 105 shillings in a special wooden presentation box. 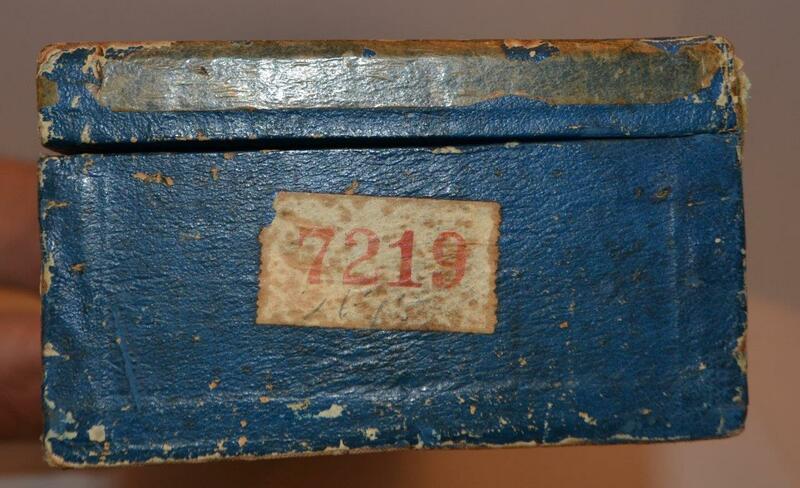 This box was initially a red colour with blue felt linings and by late 1937 the box was changed to a blue colour with green lining until the end of sales. This price was later increased to 110 shillings in early 1939 but production was discontinued in very late 1939 due to the on-set of WW11. By September 1940 it was no longer catalogued though production had ceased much earlier. In the mid 1940’s their Binns Road plant was commissioned for Government work and it was later tasked with designing and producing various bomb carriages for the Lancaster bombers. The PE was Hornby’s first and only 6 wheeled locomotive as well as their first and only attempt at scale railroading. Prior to that time all of their electric locomotives were 4 wheeled, regardless of the prototypes. 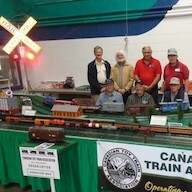 It was not sold in any train sets and was their largest O gauge 20 volt electric locomotive. No clockwork models were ever made. The PE featured soldered joints over the usual tab and slot construction method for joining the corners resulting in a cleaner, classy looking model for the time. The boiler and firebox are tapered as on the real Lizzie with detailed valve gear on the workings. The locomotive is lined in gold and black with the splashers in gold only. The PE was painted in the LMS crimson red, however, for a few months at the end of production the finish was changed to a matte red. It was also produced in a black colour usually for export with small production numbers indeed. Hornby’s PE model was based on the real record-breaking steam locomotive of the day. They were initially built in 1933 as part of the ‘Princess Royal’ class of locomotives intended for high speed passenger service. What was so record breaking about the PE was that it travelled non-stop over four hundred miles, from Glasgow to London at an average speed of 70 mph, attaining maximum speeds of 95 mph pulling a 260 ton load of four passenger carriages. My story of how I acquired my Princess Elizabeth was as a 50th birthday present to myself and from my family. As the saying goes, ‘if you can’t be good to yourself who should you be good to?’ I had read about this Princess Elizabeth being available from a well known seller in the UK and with the price being reasonable it was duly purchased as a special 50th birthday present. My wife and I occasionally travelled to the UK to visit relatives and friends, and it was a happy coincidence that we were to be in England in early August and able to attend the Minehead Train Show. Arrangements were then made to pick up the Princess Elizabeth there. For the next two weeks, we travelled around England and Scotland with the Princess never far from sight. The PE was taken to show family and friends along the way. For our return home, it was dutifully packed for carry on luggage and returned to Canada, where it resides again. I say ‘again’ because the Princess enjoyed an interesting journey – Liverpool, Northern Ireland, Canada, UK, and finally back to Canada with only three known owners. The PE was in a beautiful condition – near mint and with the presentation box and original operating instructions enclosed. Inside the box was a name – Sean McDowell. Intrigued, I inquired from the dealer whom I purchased it from if he knew of Sean or had his address. He said he did not know Sean but knew his sister and it might be possible to find an address. To cut a long story short, he was living in Toronto, Canada and sold the locomotive through his sister who was living in England. A letter was sent to Dr. Sean McDowell with a list of questions pertaining to this Princess. It has quite a history and as I found out, I am the third proud owner of this particular locomotive. Sean grew up in Belfast, Northern Ireland and in 1940 (age 5) was given a Hornby clockwork train set at Christmas time. 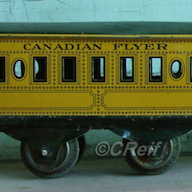 Over the next few years, more tin plate track and a few wagons were acquired for birthdays and holidays. Around 1946, his dad suggested that if he sold his clockwork train, Santa might have a better train for him on December 25th. A leap of faith in Santa Claus! The clockwork set was duly sold and on Christmas morning the Princess Elizabeth, along with two Hornby No.2 LMS corridor coaches, an oval of Hornby solid steel track and a controller were under the Christmas tree. The original Hornby Instruction sheet was included with the box which dated this PE to the 1937 production year. This present was a huge gift for any boy with this being a joint present from Santa (Dad) and Sean’s uncle, his dad’s brother who jointly purchased this treasured gift. 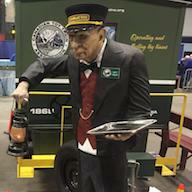 His uncle had bought it from a friend of his, whose son, at age 12 had outgrown playing with trains. Can you imagine outgrowing trains?! There was also a Binns repair label on the presentation box, which was of interest. It was explained that the locomotive was sent back to Hornby in 1951, as the reversing mechanism was not working. This was fixed and the Princess returned. When Sean attended university, there was little time for trains and after his marriage in 1962, the Princess Elizabeth was stored and never run again. He emigrated to Canada and the trains came with Sean. He acquired an interest in two rail fine scale and as he pursued this interest, he decided to sell the Princess Elizabeth. I am sure that there are many more interesting stories concerning one’s special locomotives or other trains from owners around the globe. Some owners lovingly cherish one Princess Elizabeth for a lifetime while other collectors await the opportunity to be part of the history of this great engine. Consumer Catalogue. (1937). 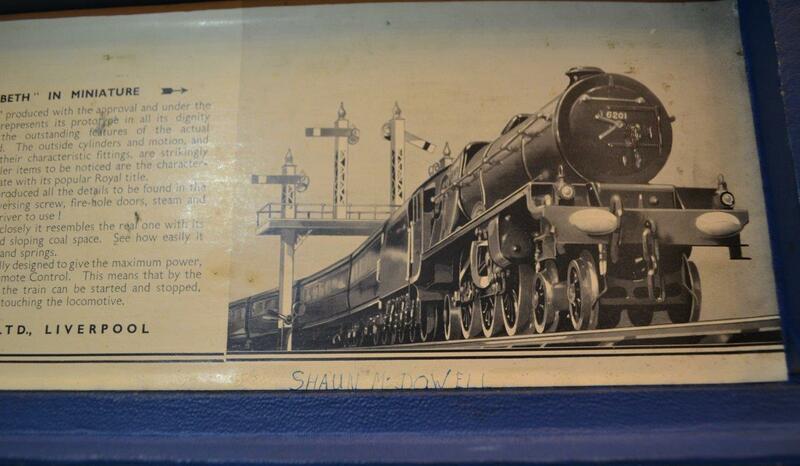 Hornby Book of Trains 1938-9. Liverpool: Meccano Ltd.
Graebe, C. and Graebe, J. (1994). The Hornby Gauge O System. London: New Cavendish Books.